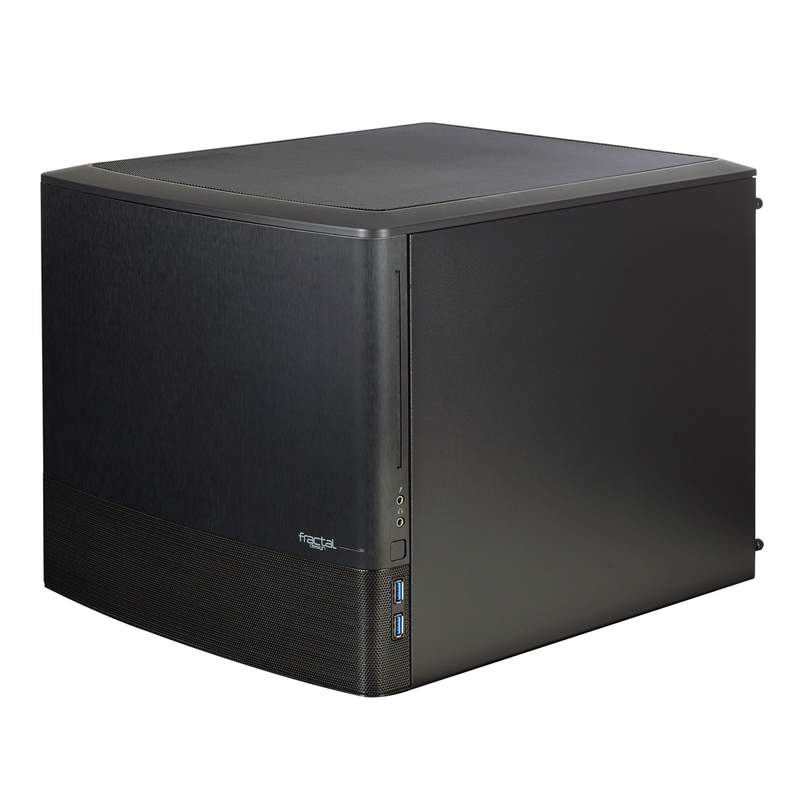 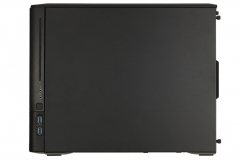 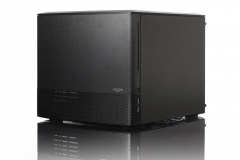 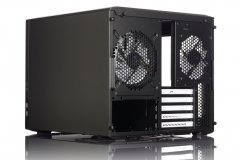 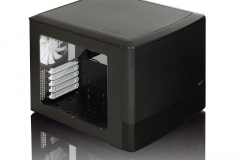 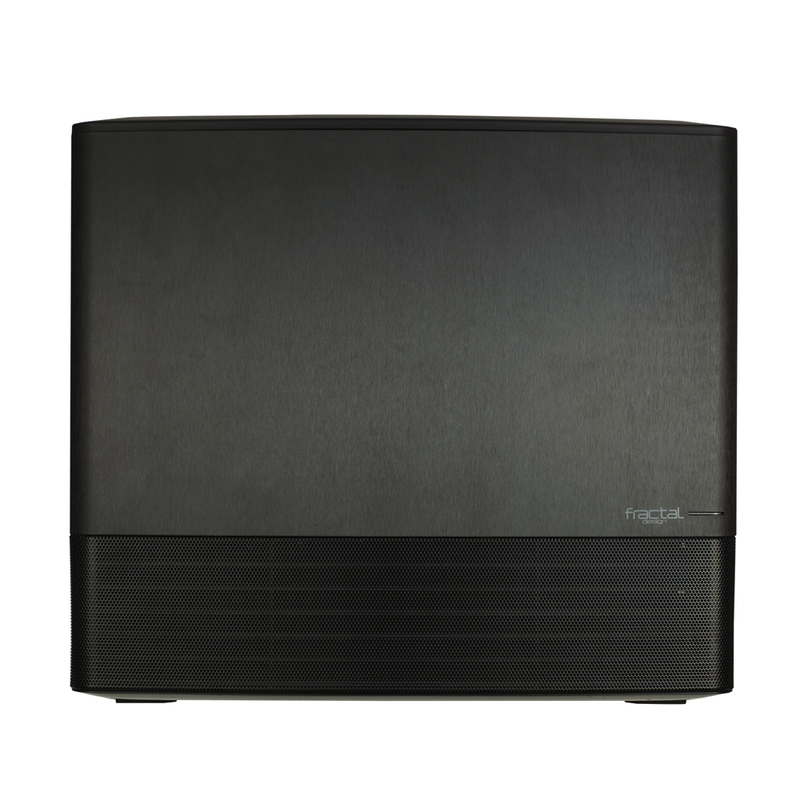 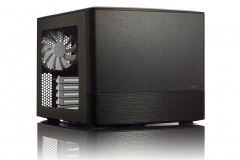 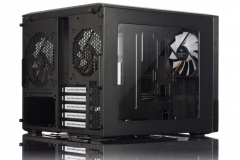 The Node 804 is the micro-ATX offering in the compact series of PC cases from Fractal Design. 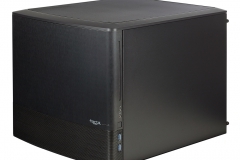 Like the previously reviewed Node 304, it doesn’t look like a typical PC chassis – it looks more like a sub woofer or perhaps a NAS unit from the front. 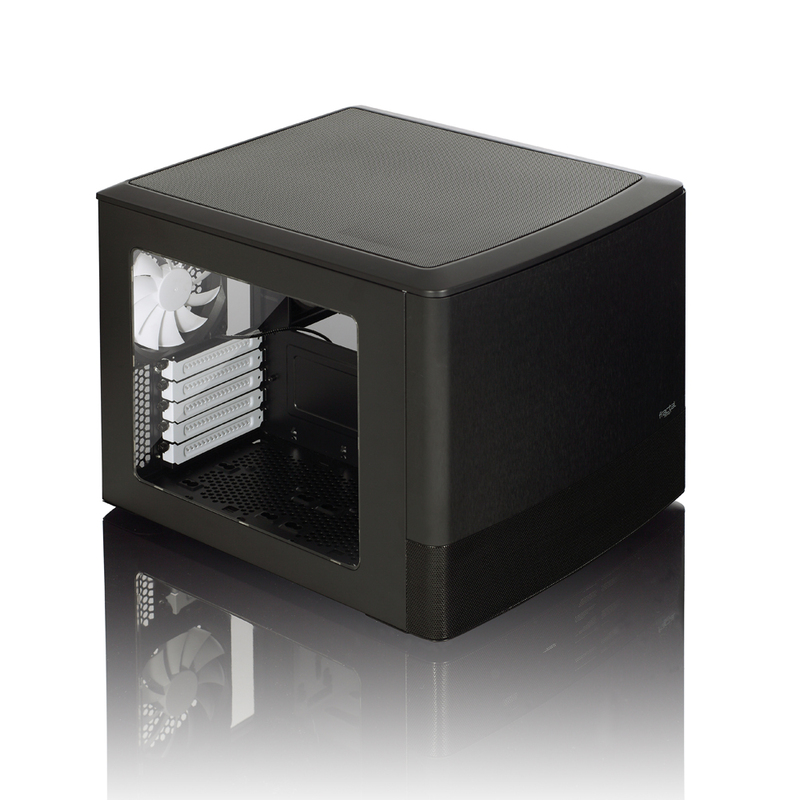 The audio profile of the case and included fans are very quiet – this is one of the stealthiest micro-ATX chassis around. 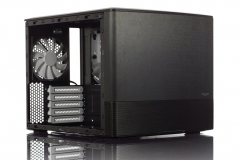 Looking at the case straight out of the box, the first thing that stands out are the physical dimensions – specifically that it’s short and stumpy. 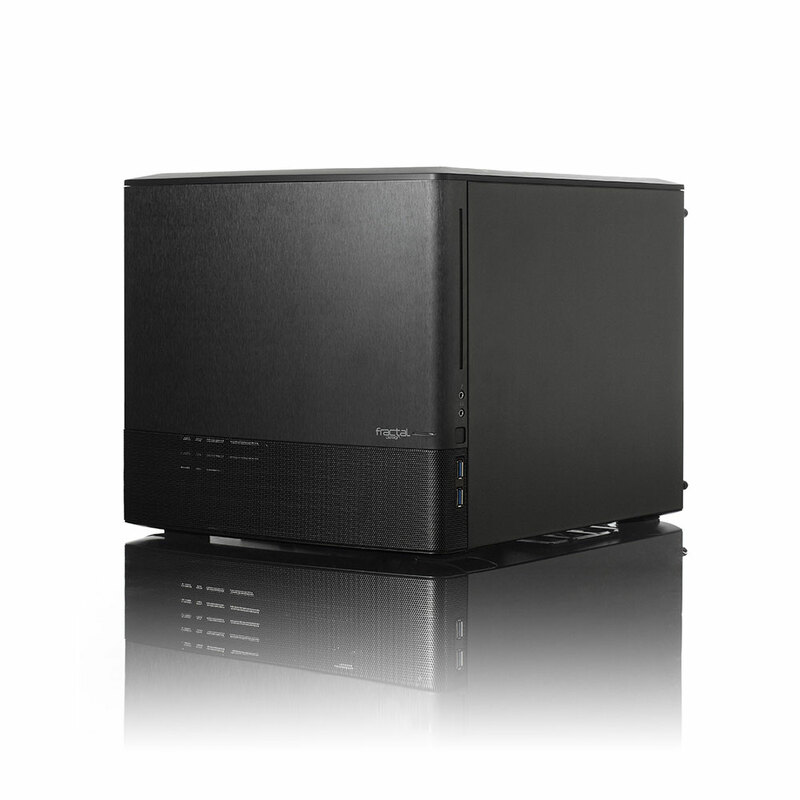 Whilst not a perfectly square cube, the Node 804 is squarer than most cases and being shorter also makes it less obvious/imposing in a lounge room entertainment unit or on a study desk. 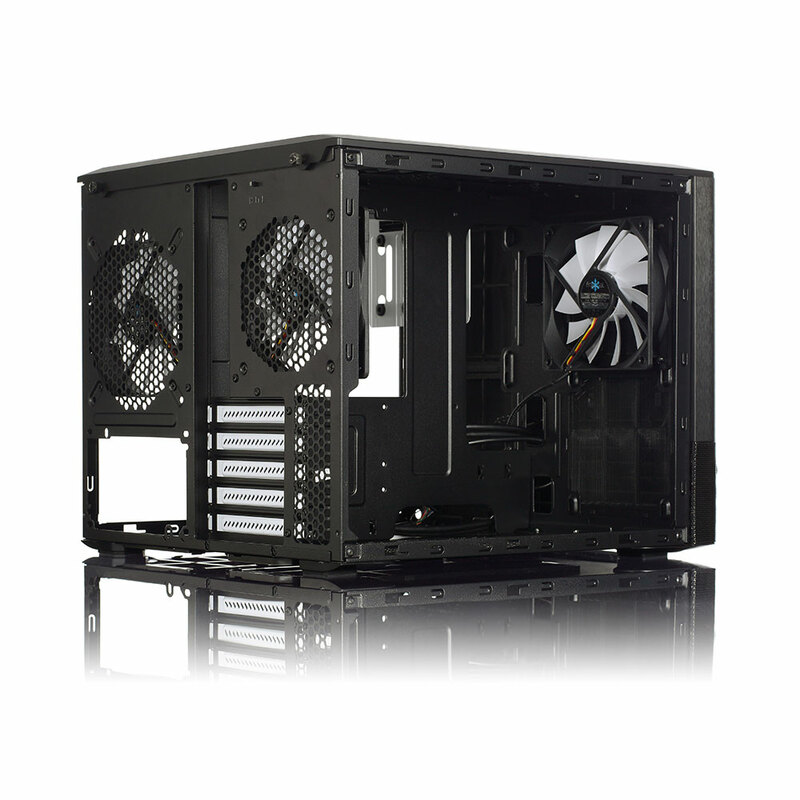 The exact dimensions are 307mm (high) x 344mm(wide) x 389mm(deep). 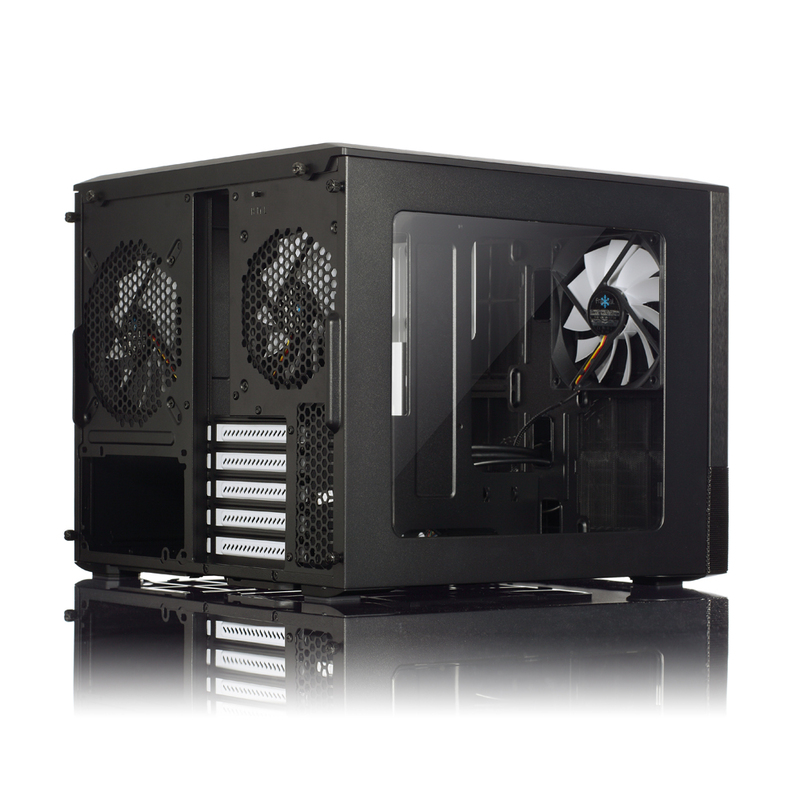 The designers managed to achieve this compact size by dividing the case horizontally into 2 chambers, one on the left for the motherboard and graphics cards with an extra PCIE slot just in case you need it and the right chamber for the power supply, cables and 8 hard drives. 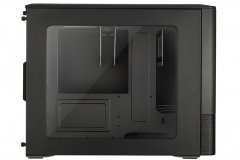 Given that most micro ATX boards have 6-8 SATA ports, this is good news but it gets better. 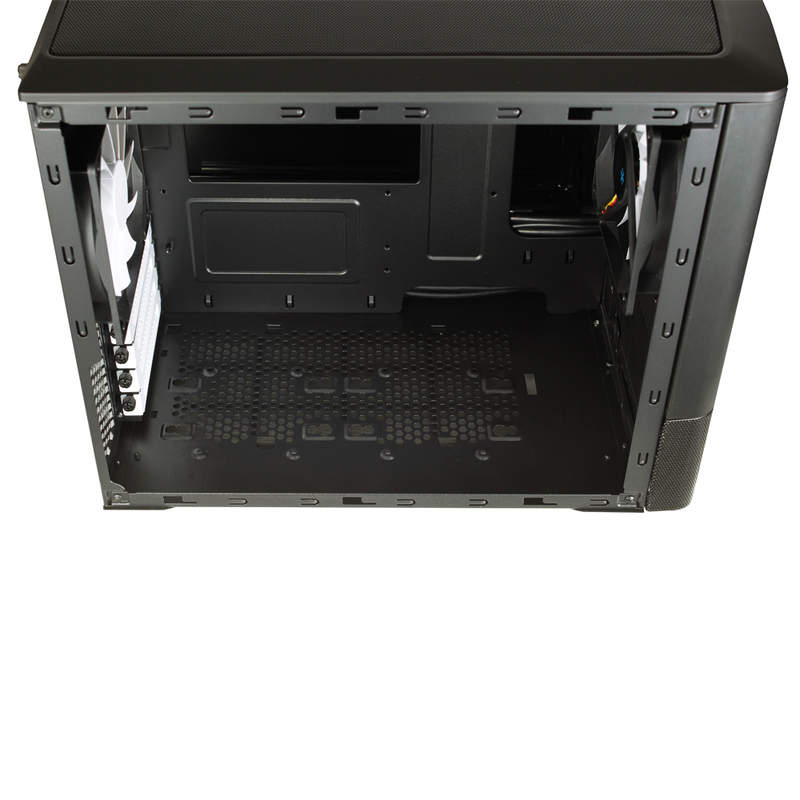 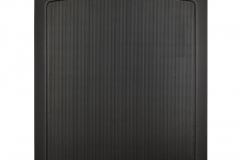 There are also mounts in the floor of the case for 2 more 3.5″ hard drives plus 2 mounts behind the front panel for 2 more 2.5″ SSDs and a slim line slot loading DVD drive which is great if you plan to increase the number of drives your system can take with a RAID card or similar. 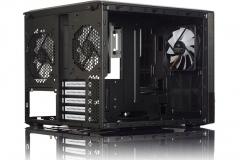 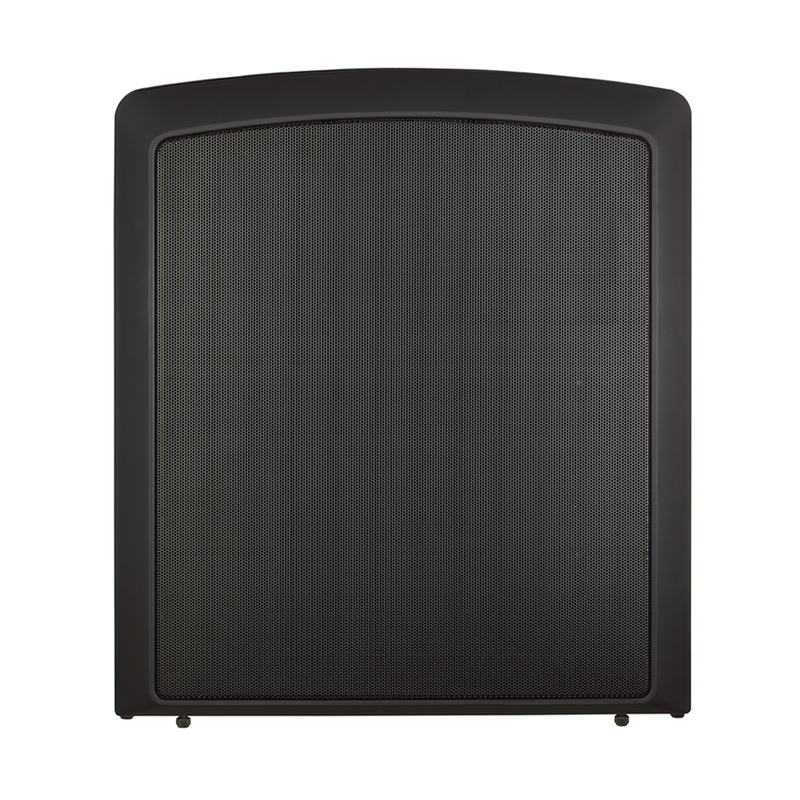 The versatility doesn’t stop there, the mounting holes for fans or radiators are extensive and beyond what the average user or even most enthusiasts would ever need. 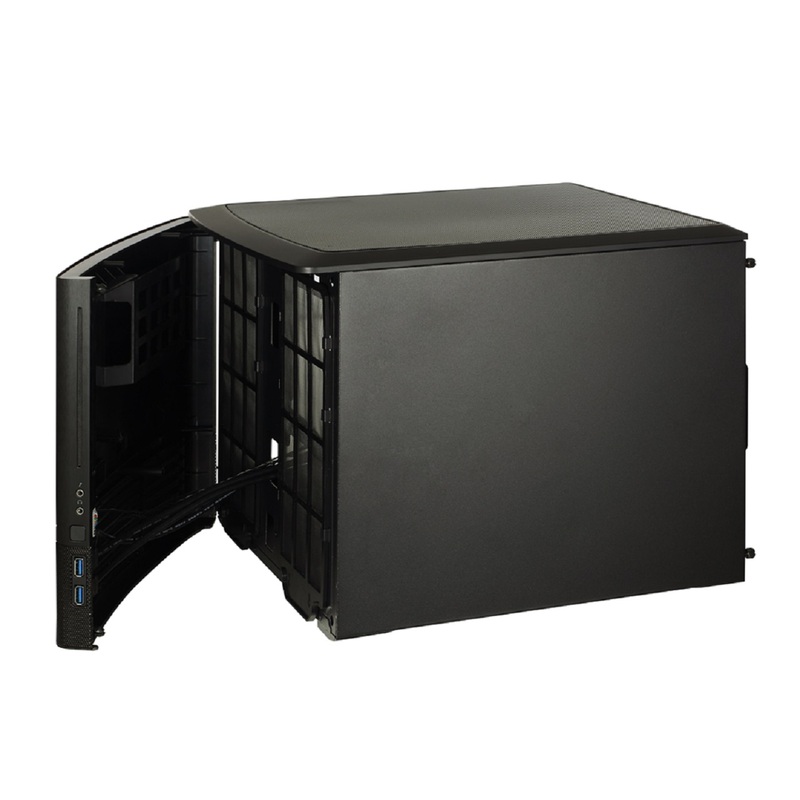 It also has 5 expansion slots in case you need one extra for a large graphics card or wanted to mount a hard drive at the bottom of the case and need the clearance. 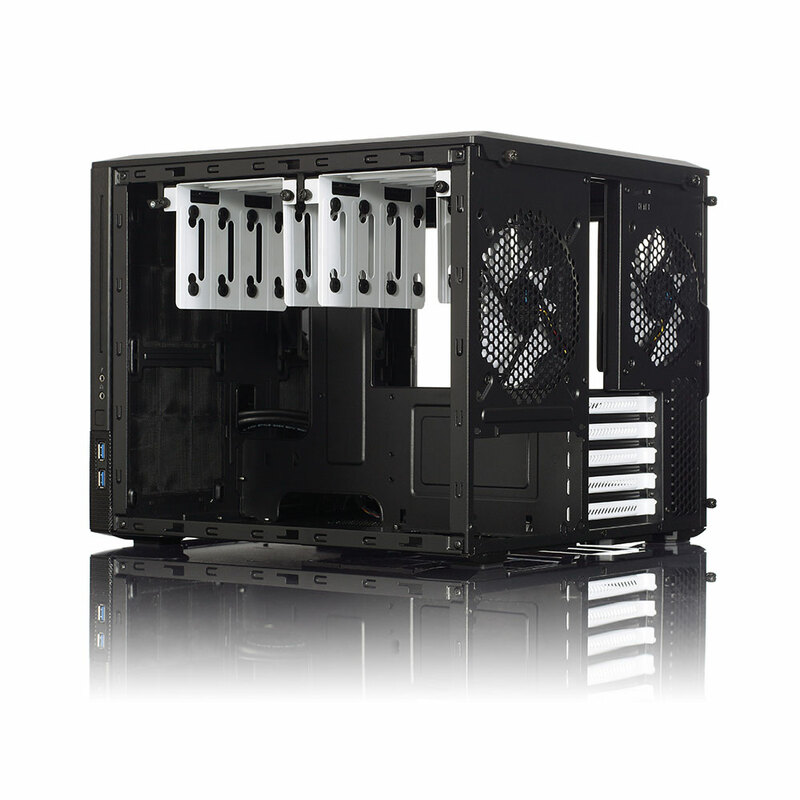 Like other Fractal Design cases, they have continued the trend of giving the system builder many ways to get creative. 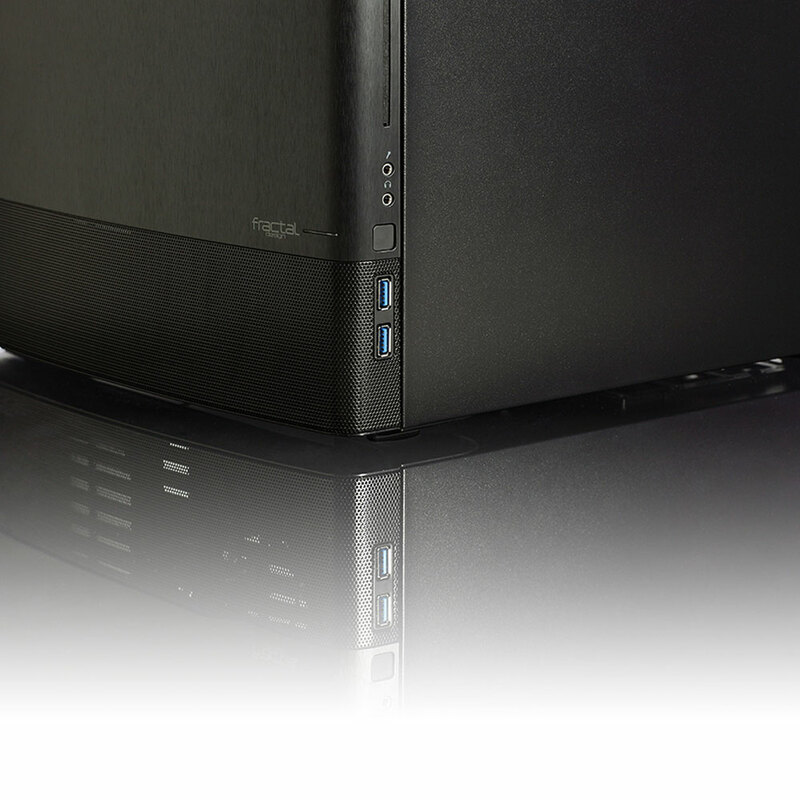 Externally, the case is pretty plain and understated – personally, I like the minimalist aesthetic and was surprised when I saw that the Node 804 had a window in the initial press release. 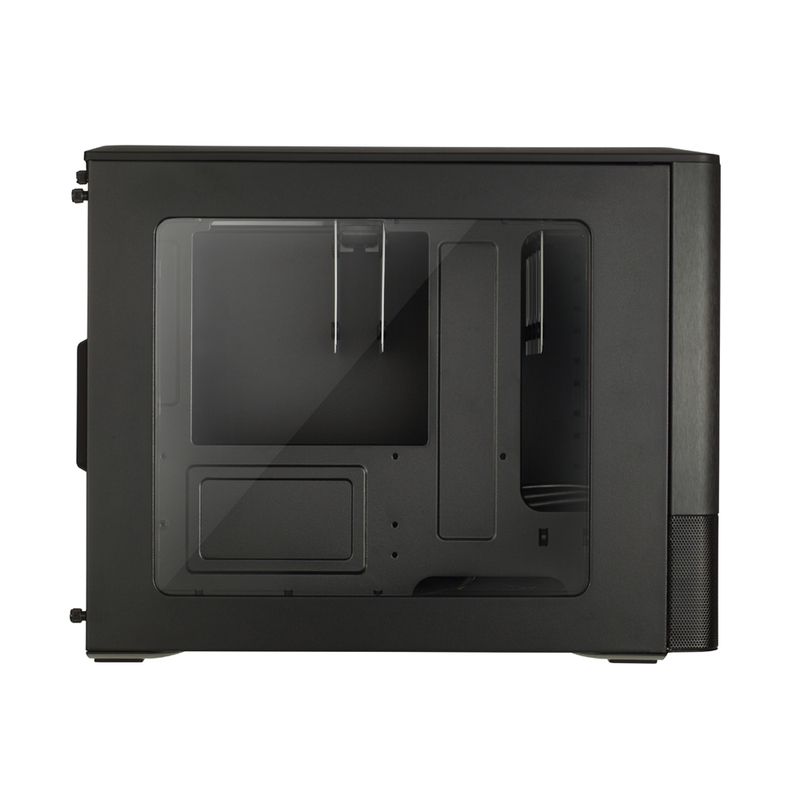 I’m pretty sure that this is the first Node series case to have a window but it works for the Node 804. 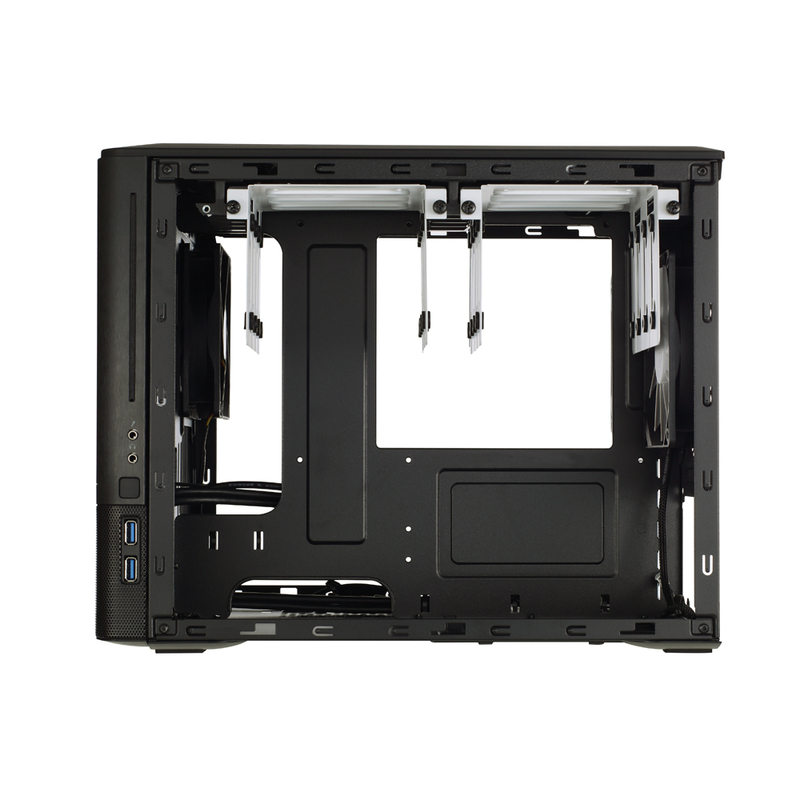 Given how easy it is to make the motherboard chamber of the case neat and tidy, having a window is a nice way to show off your system. 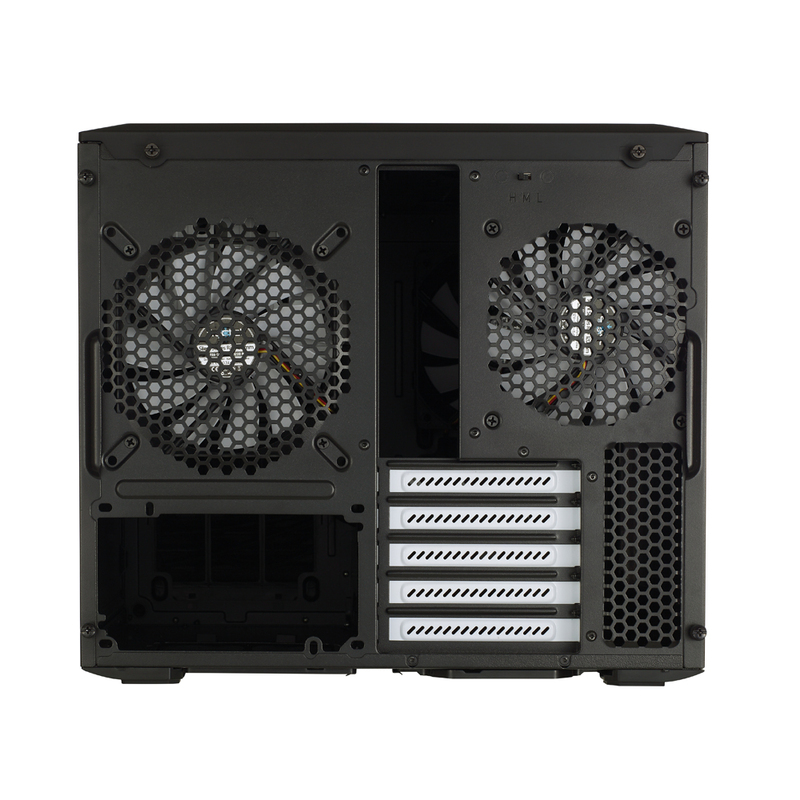 The window is also a good way to check if the fans are actually spinning because at low speed, it can be difficult to hear them. 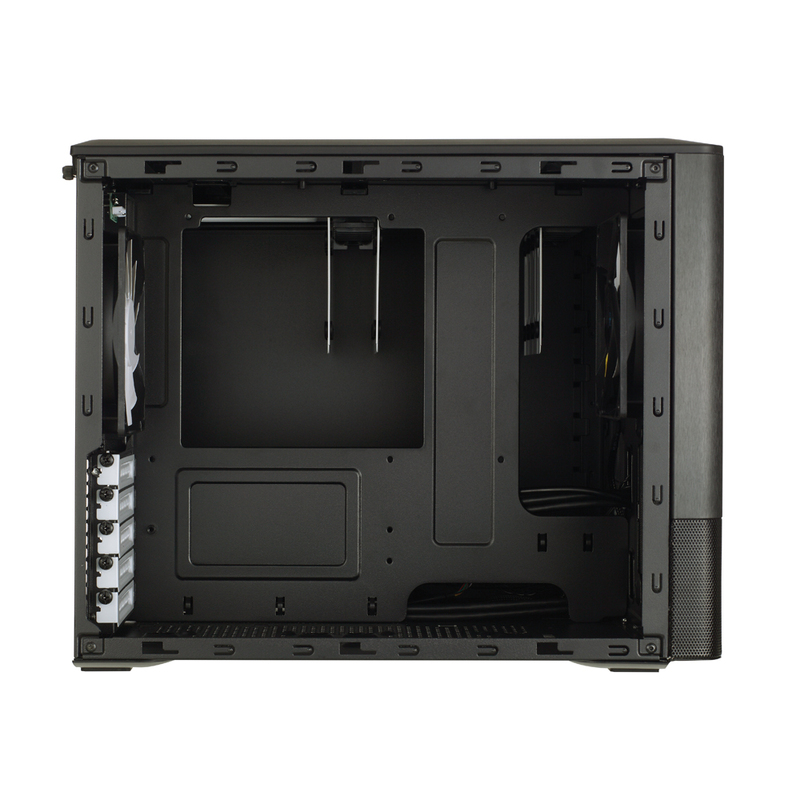 When you undo the thumb screws and take the outside panels off, the case frame oozes potential. 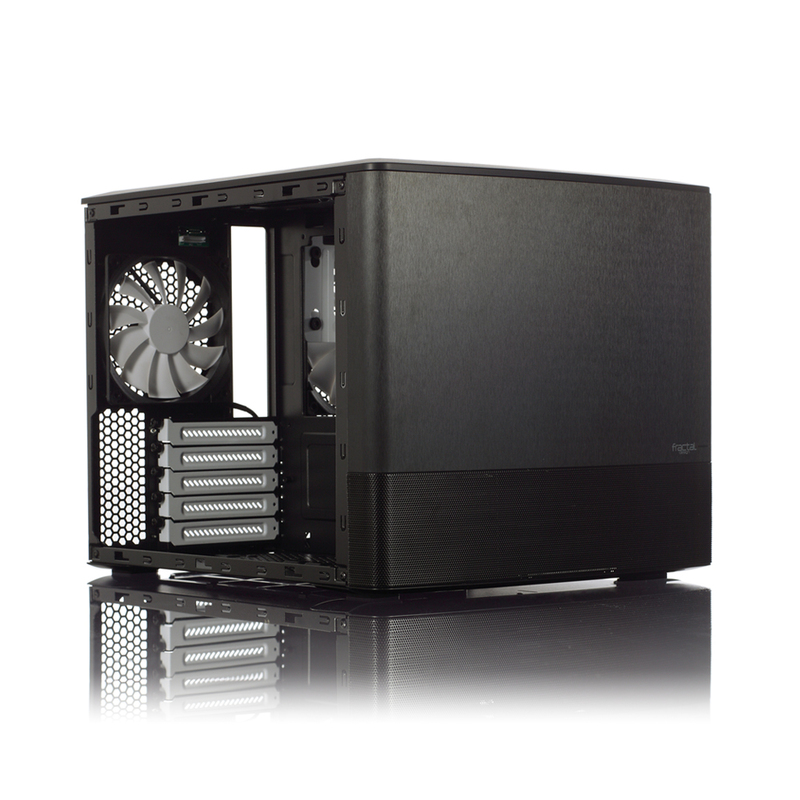 There are so many mounting points for fans, radiators, hard drives, SSDs that you can really go to town. 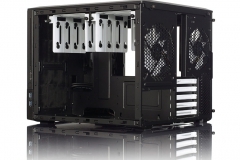 I wouldn’t normally consider using custom extension cables (eg. 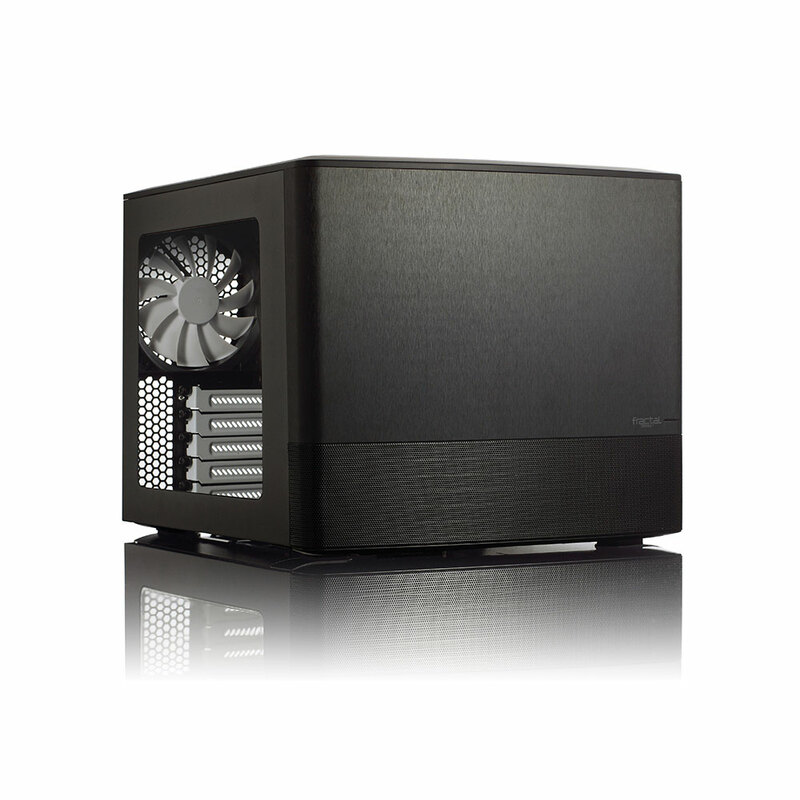 BitFenix Alchemy) in a small form factor rig due to issues concealing the excess cabling but the Node804 basically encourages this with the large hard drive and PSU chamber on the right. 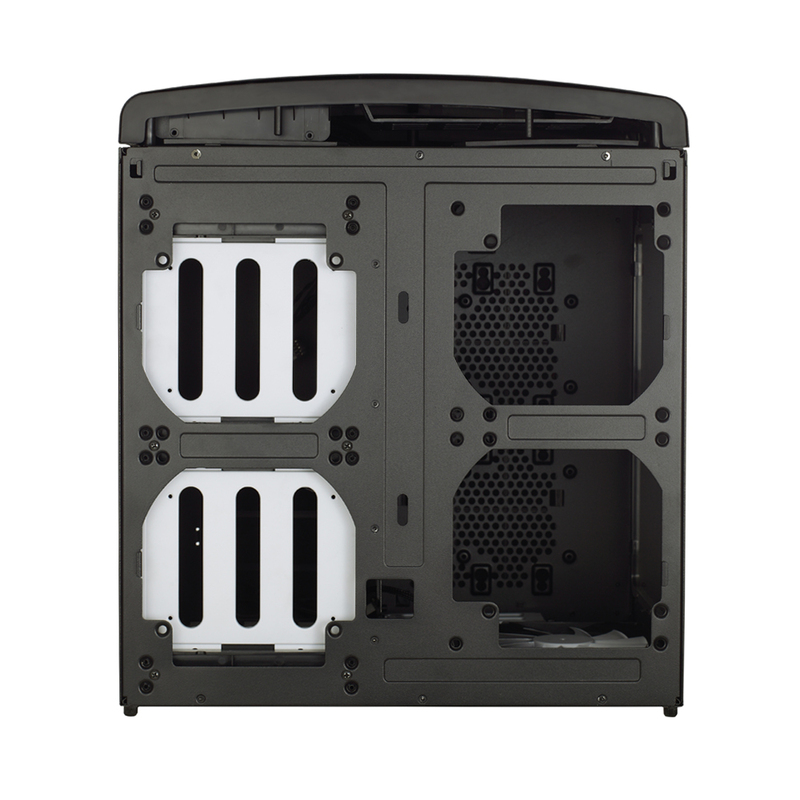 The Velcro straps in the floor take care of excess cable effectively and there are a few good spots to zip tie the ones that need routing. 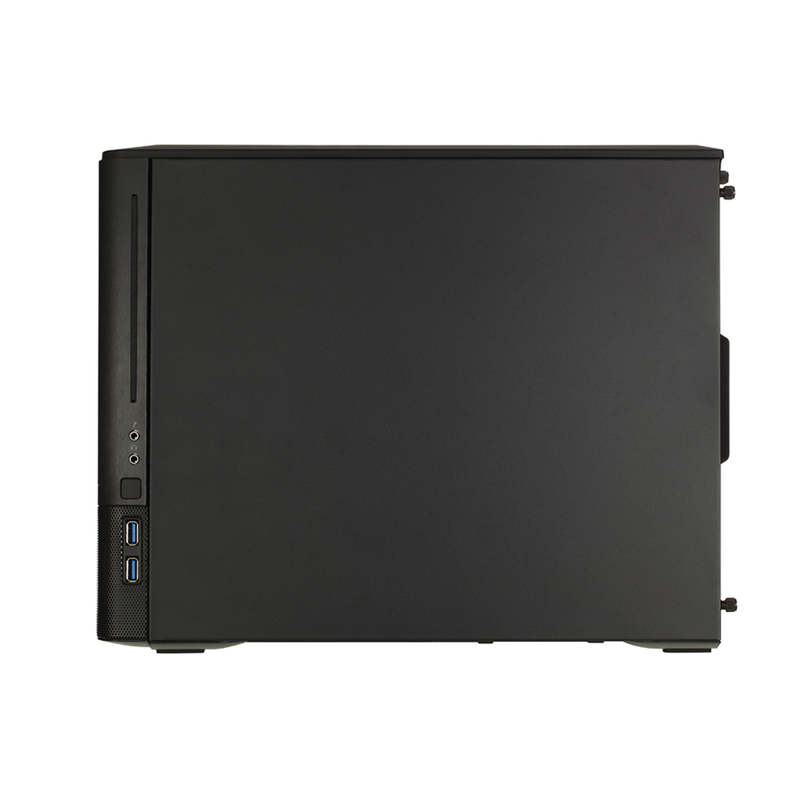 The front panel comes off without any thumb screws and allows you to mount 2 SSDs and 1 slim line slot loading optical drive behind the brushed aluminium panel. 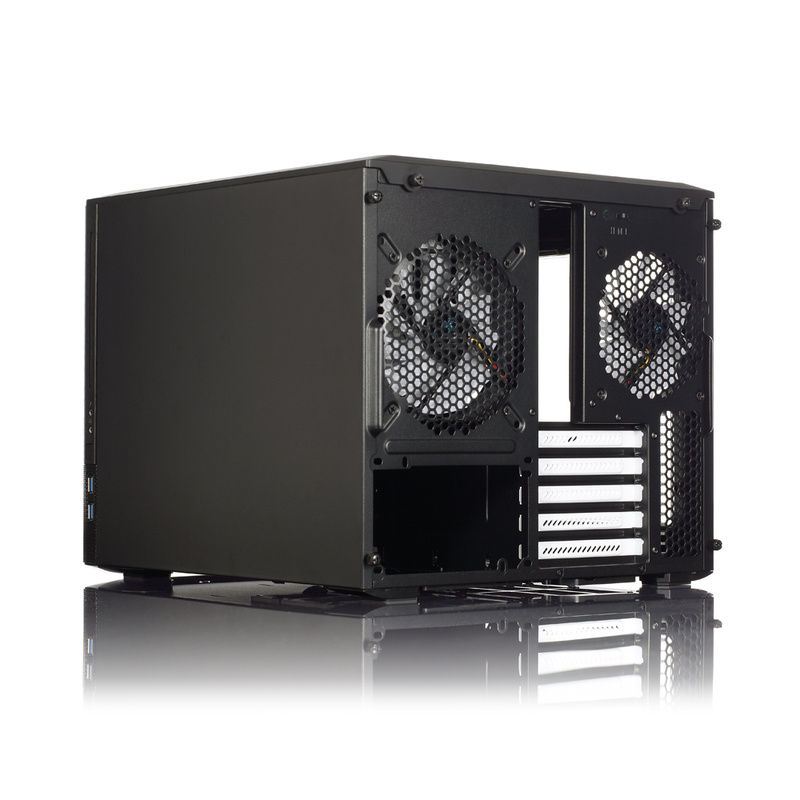 The airflow design of the Node 804 is well thought out with front 120mm fans (1 fitted by default but it can take 4) and 2x120mm fans exhausting at the back. 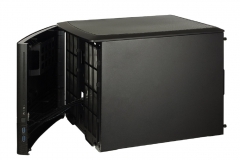 There are mounts in the roof as well but I can’t see the need unless you fit radiators. 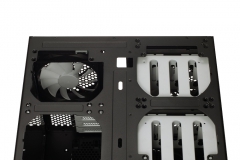 In our practical build, the performance of the fans in their default positions on low speed was more than adequate to keep our overclocked test setup cool and quiet. 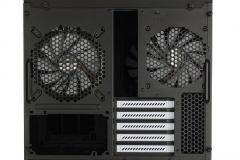 We did add another 120mm fan to assist our sandwiched GTX 670 cards in the SLI testing but for a single graphics card, the included fans are enough – no more money to spend here. 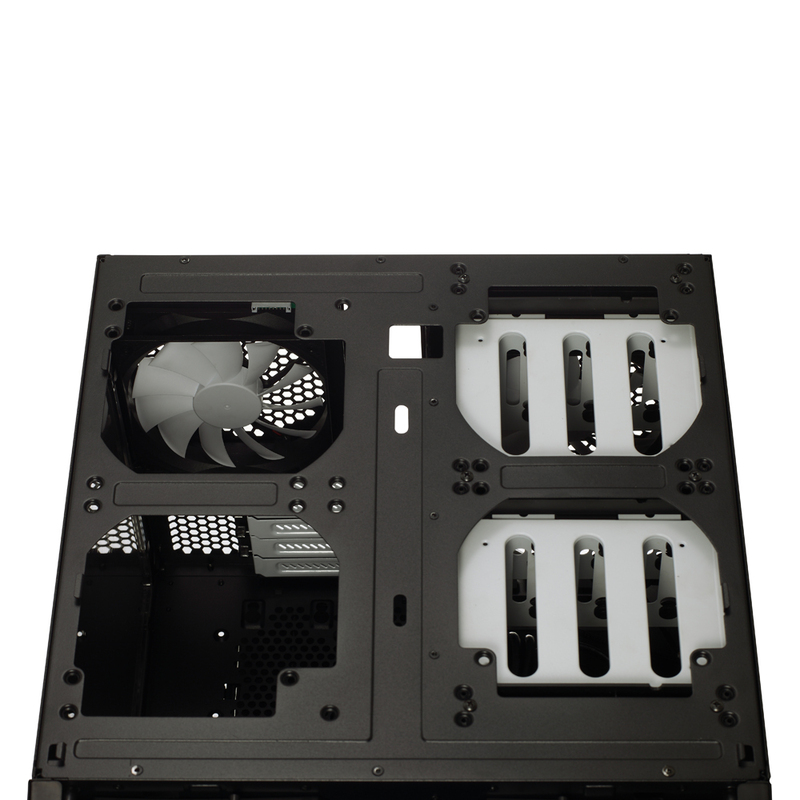 After an initial look around the case the only thing I was left wondering about was the fan controller and thinking how to make it neat. 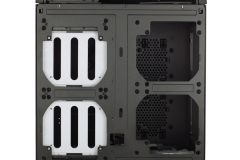 It turns out that this isn’t such a big deal as you can easily route the cables through one of the holes in the motherboard plate to the hard drive chamber or if you don’t want to use the controller at all, just unplug it from the inside. 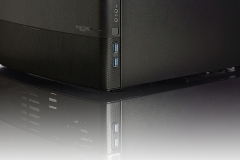 It wasn’t immediately obvious but you can just unplug the cables from the switch – nice. 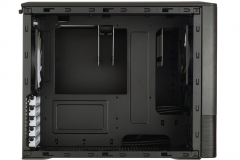 Whilst this isn’t a big deal, there are a couple of changes that would be nice to see here, full black heat shrink on the cables to hide the wires better and/or mount the switch in the hard drive chamber instead so you can’t see the cables through the window.